I'm always looking for ways to manage my stress and my mom often tells me to meditate on scripture. I know I should be doing this. The problem is that, I find it difficult to meditate. It's so difficult to "turn off" my mind, almost like trying to have quiet time to calm my mind only amplifies my inner chatter and the anxiety that goes with it. For me the greatest problem in meditation is thoughts preventing any connection. I read an article before of how these powerful Quartz Crystal Singing Bowls provide people the opportunity to have a transformational experience. So when I came across these beautiful creations of nature called singing bowls, I was like, "What is a singing bowl?" I have heard that singing bowls are often found as a part of feng shui. Practitioners believe that the bowls clear a living area of bad energy. Well, the tones produced by crystal bowls are not just heard by the ear; you feel them in your body, with certain tones affecting your energy centers (chakras) for healing, balancing and meditation. It has been found that among the wave patterns of different singing bowls there is a measurable wave pattern which is equivalent to the alpha waves produced by the brain. 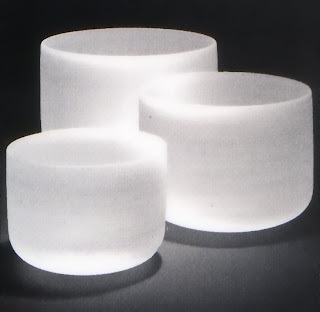 These bowls instill a sense of deep relaxation and "inner space opening up". You can find complete details at Silver Sky Imports as they include individual sound samples, pictures and descriptions for each bowl. Many other related products such as Crystal Singing Bowl Accessories, Nepali Gongs, Malas Beads and Tibetan Singing Bowls also included. So go check it out! Does anyone here own his or her singing bowl? If yes, I'm sure you have access to a magic land of great variety! Just got home Monica! Oh he he the singing bowls are here today! Dunno still have to refresh few times before I see stupid ec widget…..
wah how to drop 900 like dat.. Recent blog:=- My 1st Coca-Cola Contour Glass!